Eventastic offers amazing online ticketing and registration tools where you’ll be able to effectively market and manage what you’re offering whether it be ticketing, free registration, e-commerce sales of items or services as well as taking donations or crowdfunding for a cause. Perfect for small gatherings or mega events and attractions, we’re sure you’ll enjoy its user friendly interface both from an organizer as well as ticket purchaser point of view. Let’s Get Creating on Eventastic.com! Once you click “Create” the process simply involves clicking and filling in templates to populate your free micro website with all the marketing features you’ll need to help make it a success. Remember that each template popup has tiny information guides if needing further direction. Edit location,date,time, description and even add a custom URL! It is within this template popup you’ll see your shareable link to this created page ready to copy and paste when page is completed to your satisfaction. The location/capacity button will give you the option of adding a location & venue capacity if limited. This capacity number entered will be relevant if choosing within the ticketing template to count your ticket type purchased against capacity so you’ll never over sell. Upload the square profile picture at the top left to represent your page. This photo will also serve to be the logo or picture to appear on the purchaser’s tickets, vouchers or passes. Add one or multiple cover photos (recommended 1200x600px) for marketing/advertising purposes to give the guest a feel of what they will experience when they attend. Click to add ticketing/registration to your page. Add and customize details of your tickets, vouchers, passes created ie. name, duration of sale (both time and date) and pass along fees to purchasers as you wish (leaving you with no cost) Remember a free ticket created allows for free registration. Add any number of registration questions to any ticket type created for purchasers to answer when completing their transaction. Add promo codes to any ticket type created and have a special message added to the ticket when purchased using this promo code. Customize your ‘purchase button’ (auto set as Get Tickets – Register) within the ticketing feature to lead purchasers to “Get Tickets”, “Register Here”, “Click Here To Sign Up” or customized as you wish. In the same fashion by filling in templates you’ll be able to click and add/edit all other marketing features and options on your page like ‘additional files’ (menus/parking), ‘agenda’ (listing of speakers or entertainers), ‘e-commerce buttons’ (sponsor acknowledgement, guest funding, donation, silent auction and item/service sales), ‘social media links’, ‘photo albums’ and ‘video’ messaging. Click the ‘Ticketing Kiosk’ button for your auto-generated custom kiosk where when shared ONLY your ticketing or registration options will appear and not the full marketing page you’ve created. 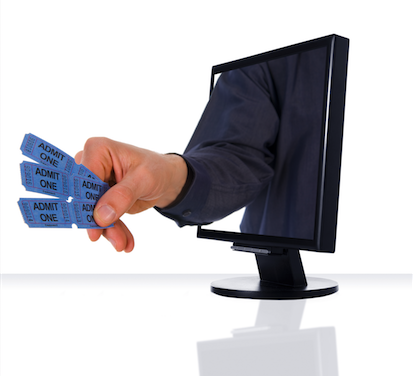 Within the ticketing kiosk feature you’ll have the option to cut & paste your kiosk code right into your own website! The code you add to your own website will allow purchasers to click the button on your website and purchase tickets or register without being bounced to other websites for purchases! Our marketing features offered for your ticketing/registration microsite were designed to help you advertise your offering and support and encourage its success! If it is open to the public and not a private listing then once your page is completed to your satisfaction click to “Make your page public” (at the top of your page in preview mode) and your page will automatically be loaded into Eventastic’s search page where all public listings are presented as clickable cards helping you get the word out faster and encourage more sales! We’re always available to answer your questions! Please email support@eventastic.com and we will be happy to assist or click here to watch our helpful tutorials!